Double sided, industrial strength SilverTape® provides long term, high performance holding power and is perfectly suited for both interior and exterior applications. SilverTape® offers superior high bond strength and can replace mechanical fasteners like rivets, screws, spot welds and liquid adhesives on a variety of substrates. Silvertape® can be cut to most widths to fit your application. Available in rolls of tape or spooled for longer run applications. 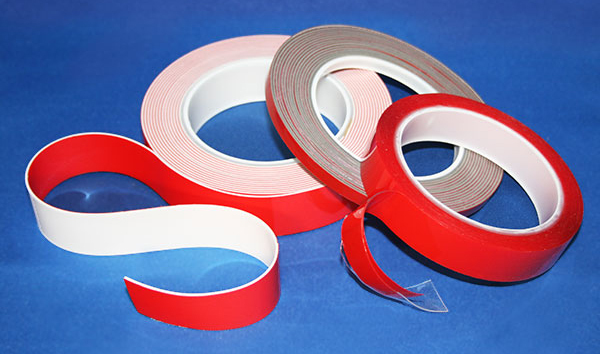 High bond tape can also be die cut into custom parts or provided in strips for convenient peel and stick applications. Through and through adhesive makes high performance SilverTape® virtually indestructible against wind, water, high impact, shock and other environmental effects. High performance, double sided mounting tape is available in black, white, gray, and optically clear.